If you won a silent auction, please contact jeanne.sylvia@towerfoundation.com to arrange pickup. If you had a winning raffle ticket, please contact marietta.frangiskatos@towerfoundation.com for pickup. 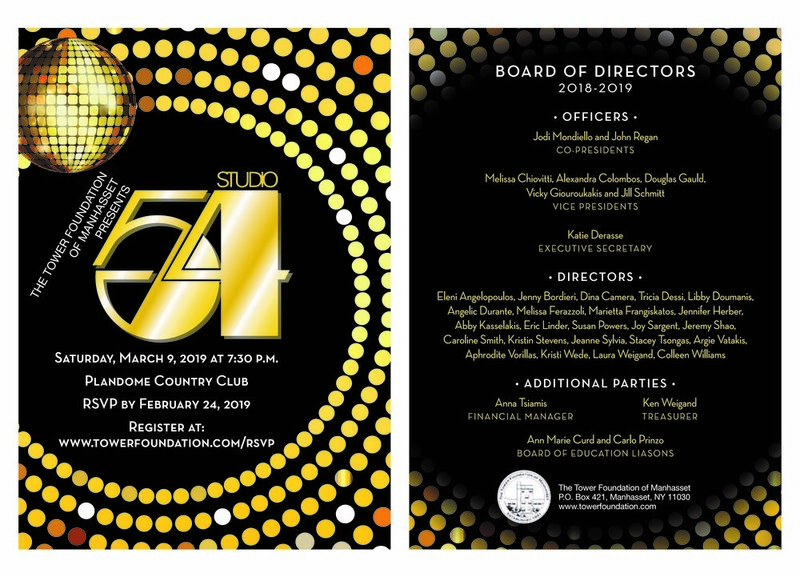 The glittery, velvet-rope glamour days of Steve Rubell, Andy Warhol and Bianca Jagger are ready to rise again on Saturday, March 9th, as the Tower Foundation of Manhasset presents Studio 54! Proceeds from this annually sold-out fundraiser—to be held at Plandome Country Club at 7:30 p.m.—will once again benefit the Tower Foundation’s mission of providing grants to the Manhasset public schools that will enhance the educational experience of our students. This year’s initiative will be to sponsor additional “Future Ready” classrooms, which feature innovative enhancements, such as flexible furniture and improved technology to allow for a deeper level of academic engagement for Manhasset’s scholars. So dig out that Halston and your best platform shoes and come join us to shake your groove thing for a great cause! Digital camera-ready artwork should be submitted in PDF format with font embedded and at the appropriate size (see reverse for measurements). that are small file sizes (less than 1MB) may reproduce poorly. your text will be reformatted for production. Tricia.Dessi@towerfoundation.com Please put “Tower Journal” in the subject line. We will advise about a rescheduled date and any refunds for pre-paid bingo cards! Please accept our apologies and stay safe! 20th Annual Dinner Dance SOLD OUT! It is with an attitude of gratitude that we have to announce that our 20th Annual Dinner Masquarade Ball 2017, is now sold out. We regret any disappointment this news might cause, and would like to express our sincere appreciation at your overwhelming interest. Please continue to join us in our ongoing effort to enhance our children's educational experience. We look forward to seeing everyone at future Tower Foundation events. Thank you so much for your unyielding support! 19th Annual Dinner Dance SOLD OUT! It is with an attitude of gratitude that we have to announce that our 19th Annual Dinner Dance, Sequins and Bowties 2015, is now sold out. TOWER’S 2015 INITIATIVE IN ACTION! The 2015 Tower Foundation’s initiative of providing Google Chromebooks to all English classrooms in grades 7-12 finally came to fruition with the advent of this school year! 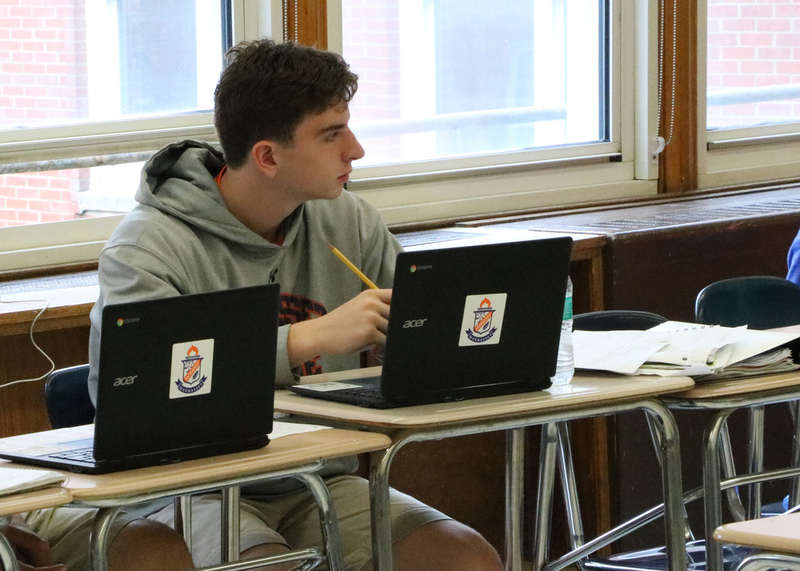 Thanks to the efforts of Tower’s fundraising over the past year, three hundred sixty (360) Chromebooks are now in place and in use by Manhasset’s Middle and High School students. “Google Chromebooks are part of a larger initiative to give students more access to mobile computing technology,” explains Sean Adcroft, Director of Instructional Technology and Libraries for the Manhasset School District. Used by teachers in conjunction with the English curriculum, the Chromebooks enhance each student’s learning experience by allowing for basic web browsing and light computing designed to compliment the lessons and allow for an improved educational interaction between instructor and student. Complimenting the addition of the Chromebooks are carts, printers and some wireless access points, which were provided by the school district itself. “What I like most about this project is that fact that it was truly collaborative,” smiles Adcroft. In fact, the rollout has been so successful that the district is now looking into the possibility of expanding into Social Studies classrooms, as well. Shop to Support the Manhasset Public Schools at the March 2015 Vineyard Vines Manhasset Shopping Event! Join event hosts Janice Rohlfing and Jill Schmidt for a special event! Take 10% off your purchase while vineyard vines give 10% back to the Tower Foundation for grant support to our school system. Thursday, March 26th @ 5-9pm. This event has been cancelled out of respect for the tragic passing of a young child in our community. Thank you to all for a SPECTACULAR 2015 Dinner Dance! · The The Tower Foundation of Manhasset presents the Sequins and Bowties 2015 Gala. · Join us for a fantastic fun-filled evening and help raise money to enhance our children's educational experience! Please consider making a donation to our silent auction for this event! Shop at ANY participating stores at Wheatley Plaza and Americana Manhasset from December 4 – December 6 and 25% of your purchases will be donated to the Tower Foundation of Manhasset. Don’t forget to tell them you are shopping for Tower at checkout!